I love eggplants, but . . .
Ameir does not. Marriage requires sacrifices. BUT STILL. I make some killer eggplant sometimes. Here’s one of my favorites – not just because of the flavors, but the colors and textures. Everything except the last garnishes can even be done a couple of days ahead, and tastes best at room temperature, which makes it great for potlucks and parties. Hummus: Chickpeas, tahini, water, lemon, food processor. 1. Make a batch of your favorite hummus. Choose a recipe that gives you a thicker consistency so it can hold the topping. 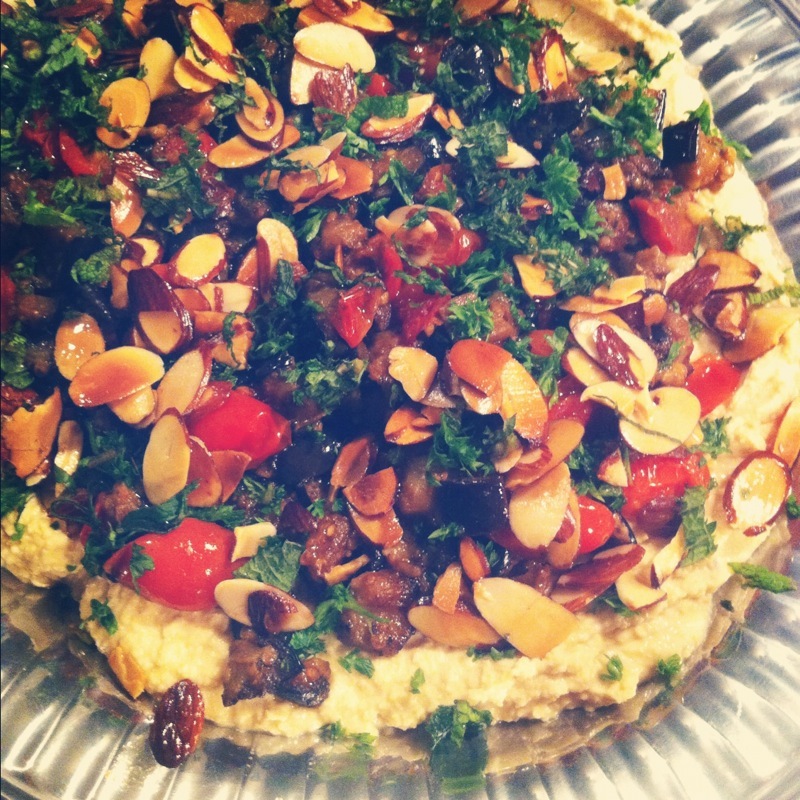 I’ve had luck with Yvonne’s hummus recipe in the Ramadan Recipes App and with this one from Simply Recipes. For a lighter-tasting hummus, I rarely add garlic or cumin, and always add the zest along with the lemon juice. Also, this works. 2. Cut the eggplant into small cubes. Drizzle with a bit of olive oil. Sprinkle just a bit of cumin, coriander, and paprika (maybe 1/4 tsp each) and toss. Heat olive oil in a large non-stick frying pan over medium high heat and toss in the eggplant into a single layer (do a couple batches if necessary – the sear really makes the dish). When the eggplant is seared, add a couple of cloves of diced garlic (optional, for a stronger and more savory flavor) and salt to taste. Meanwhile, cut a pint of cherry tomatoes in half. 3. Once the eggplant is soft, which takes about five minutes, move the eggplant to the side of the pan & turn the stove up to high. When it’s hot, add the tomatoes and cook until they get charred and release some juice. Mix it all up and let it cook together on medium heat for another couple minutes. All of this takes about 7 or 8 minutes – don’t overcook the vegetables. You want them to hold their shape, not be mushy. Remove all that deliciousness from the pan and let it come to room temperature. 4. When you’re ready to serve, get a big, beautiful platter. Spread the hummus all the way around, and then spoon the topping over it, leaving a border of hummus. 5. Last touches: Put the sliced almonds in a cold pan with a couple glugs of olive oil, then heat the pan and toast the almonds until they’re golden brown. Sprinkle these nuts and the oil all over the topped hummus. Cut up a small handful of parsley and mint and sprinkle on top. Serve with pita bread.